Fred Ebb and Bob Fosse�s hit musical, based on the play by Maurine Dallas Watkins (Play Ball), centers on Roxie Hart � a wannabe singer/actress in the 1920s. When she gets jilted by her extramarital lover, Roxie ends the relationship Chicago-style (i.e., plugs him with gunfire). Next thing she knows, she�s taken to prison awaiting trial for first degree murder and, if convicted, could be the first woman Chicago hangs in the past forty years. 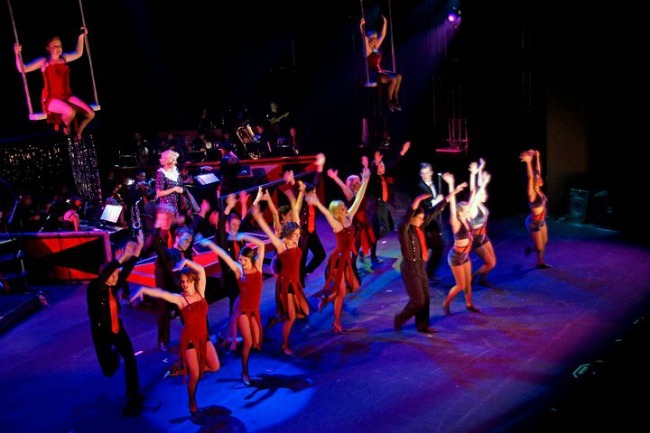 Could this spell Roxie�s doom, or is it a singular opportunity for Roxie and her lawyer Billy Flynn to use a little Razzle Dazzle on the path to money, fame, and All That Jazz? The Young Artists Ensemble performing in the Thousand Oaks Civic Arts Plaza dazzles indeed with a remarkable production of this stage classic featuring jaw-dropping youth talents from throughout the area. And they�ve got some top adult talents working with them, led by Broadway veteran Mayme Paul as director and choreographer who has a terrific sense for staging, comedy, and challenging dance numbers that her performers nail. Her touches are evident from the opening scene as the spot-on orchestra plays the overture while an amusing silent film plays above detailing Roxie�s fatal little lover�s spat that kicks the story off. Speaking of Roxie, Veronica Dunne is a charismatic triple threat with a sensational sense of humor, and she doesn�t let a moment of comic potential slip by whether she�s silently reacting to her husband Amos�s pathetic testimony, or acting as a puppet to Billy Flynn�s dazzling of reporters/jurors, or enjoying her new fame (and all the new boys that come with it) in her self-titled tribute to Roxie. 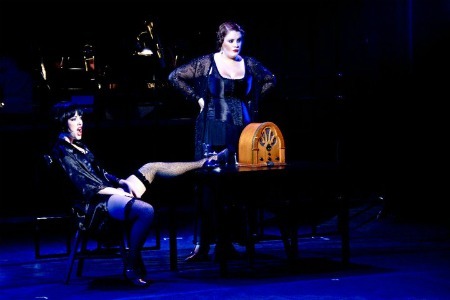 Or playing off her possible partner in crime, fellow inmate Velma Kelly, with Tessa Grady turning in a fantastic performance and outstanding vocals from the opening All That Jazz to the confident and streetwise prison star of the month to the desperate and scared Velma trying to hide her fears under her formerly confident exterior as she explains to Roxie that I Can�t Do It Alone. The dynamic duo combines for a great closing Nowadays/Hot Honey Rag. Matthew Wells is a suave and savvy Billy Flynn who excels in the cast�s show-stopping We Both Reached for the Gun and his Razzle Dazzle in the cleverly staged circus courtroom. Bailey Lauren Thompson is the classy prison Mama who is very good to us with amazing vocals and stage presence, working over the audience as easily as she does her inmate gals, and delivering great subtle nuance when needed. A. Miller is our outrageously sugary and flamboyant reporter Mary Sunshine. Oh, and there�s what�s his name, Roxie�s husband, with Kevin Gilmond delivering as the meek and awkward Cellophane cuckold. The Cell Block Tango is sassy and funny and explosive featuring Velma and extremely talented dancing murderesses Sarah Fanella, Isabella Moore, Kate Peltola, Nia Colemon, and Stephanie DeMirjian while joined by several other Tommy gun-toting cast conspirators. The incredibly deep ensemble, all packaged up in Cindy Peltola�s diverse and stunning costumes, are completely into their characters each moment of the show, delivering not just great vocals and dancing but excellent characterizations as prisoners, night club dancers, clueless reporters, and celebrity-obsessed jurors in the courts of Chicago.